Have you ever stacked firewood in a woodpile? If your answer is “yes”, this means that you can build …a whole house out of woods. At least, that’s what the fans of the most affordable and eco-friendly construction method say. 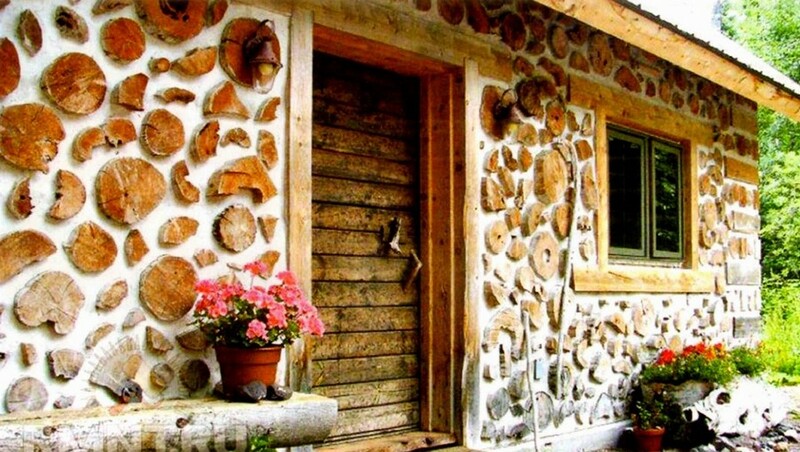 In America the method is named “cordwood”, while Russian enthusiasts call it “glinochurka”, which stands for “clay-and-chock”. In fact, the name makes no difference: the essence of the technology is fixing common woods with a special mortar mix to build house walls. From the very beginning it should be mentioned that this technology is not what you’d call “mass” – in most countries of the world firewood is used exclusively for its intended purpose. However, this construction method would be definitely of interest to those who love original and non-standard exterior and interior designs. According to the builders of cordwood houses, ancient ruins of such constructions can be still found in Europe, Siberia and Asia. But the best preserved samples are dated early 1800s and located in the north-east of North America. The peak of popularity of this technology was during the Great Depression, and we can see why. 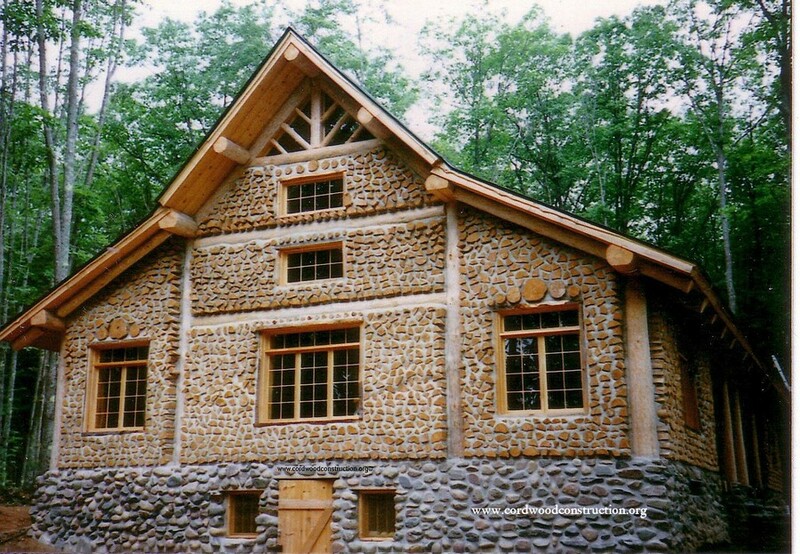 Cordwood is practically costless and could be afforded by anybody, while the simplicity of the structure obviated the need for hiring qualified construction crews. The idea of using solely free natural materials and own power in construction makes cordwood related to straw-bale construction. Contemporary cordwood house owners affirm that building such homes is far cheaper than classical timber frame constructions. At the same time they’re not in the least inferior to timber frame houses in use: they equally preserve the heat in winter and keep coolness in summer time. So, what is cordwood technology on closer examination? 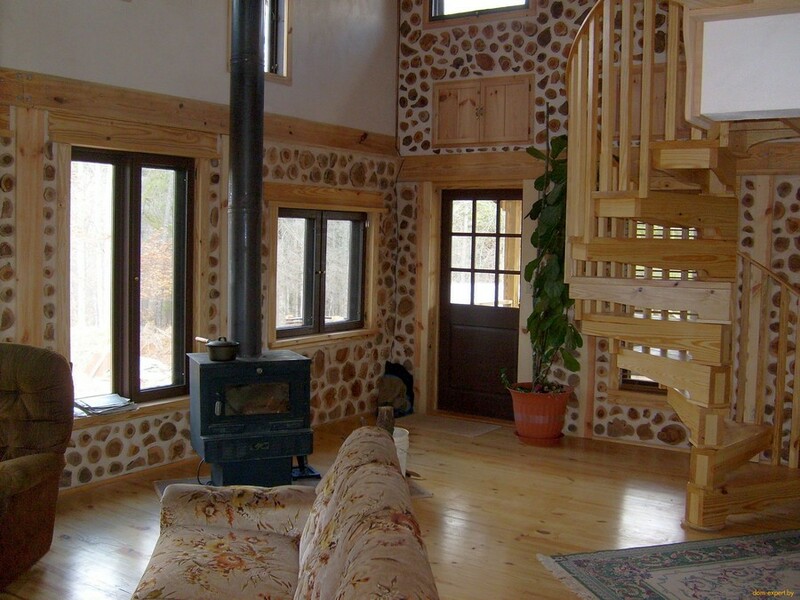 Like any home, a cordwood house needs a steady foundation. 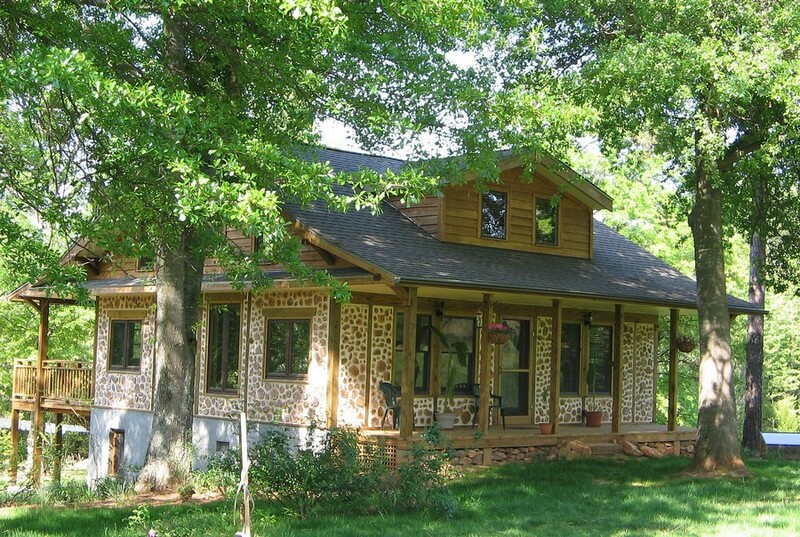 Here there’s no difference between choosing a base for a cordwood building or a timber house. 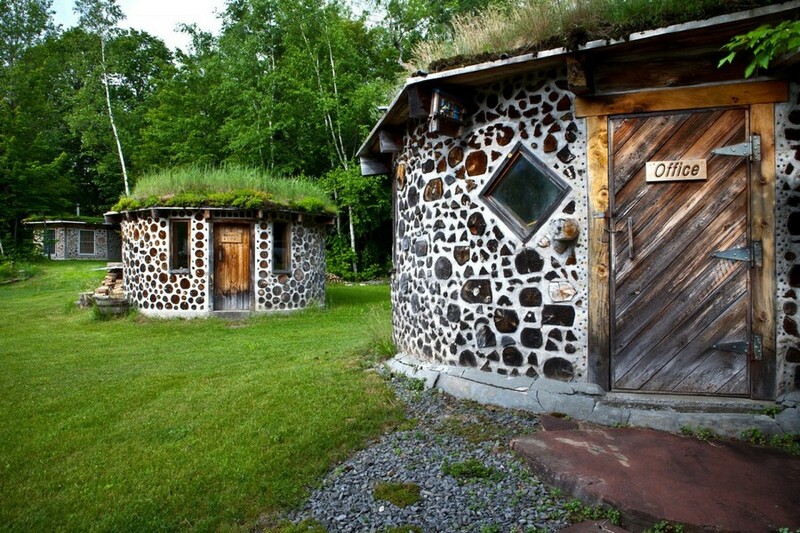 As for the walls, in cordwood houses they’re made up of wood for 40-60%. The best choice is conifers, as they contract and expand less by temperature changes. The key thing here is that woods must be dry and debarked. The ends of each log should be sandpapered and treated with disinfectant. As for the length of the woods, it can vary from 15 up to 90 cm; the general rule is that the thicker the wall is, the warmer it is. The rest of the wall composition is the mortar mix. The logs are laid across the foundation and fixed with a mortar mix. By the way, the mortar mix is applied just along the edges, while the middle part of the walls is filled with an insulating mix. The latter is generally composed of sawdust, lime, cellulose and granular polystyrene. In fact, there is no single ideal recipe for a mortar mix; there are at least three of them. For example, 9 parts sand, 3 conifer sawdust, 3 lime, 2 cement. Alternatively, you can mix 3 parts sand, 2 damped sawdust, 1 cement and 1 hydrated lime. There is also an option of mixing clay, sand and straw, but it’s not recommendable due to high risk of cracks. But the most challenging part of cordwood house building is forming the angles. Not everyone can do it right, since every log has individual dimensions, by contrast to bricks, for example. That is why most frequently this sticky point is got around by the path of least resistance – simply by making rounded walls. 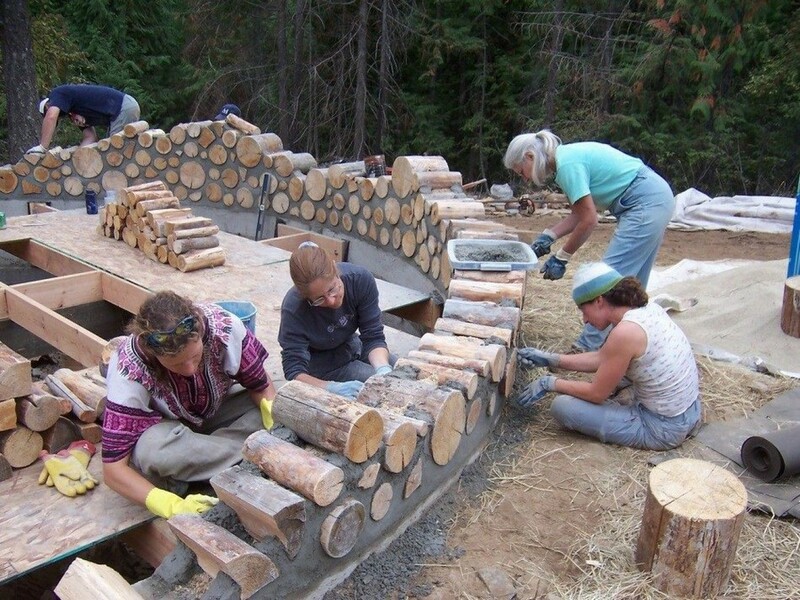 More advanced cordwood builders first make a timber frame and then fill it with woods and mortar. To make the stacking denser, experienced constructors alternate logs of various diameters. And what kind of firewood to use – split or non-split – is the matter of your choice; these two types are used equally. Also, remember that cordwood houses are built with already installed window and door frames, since there will be no way to cut them out upon the completion of the house. 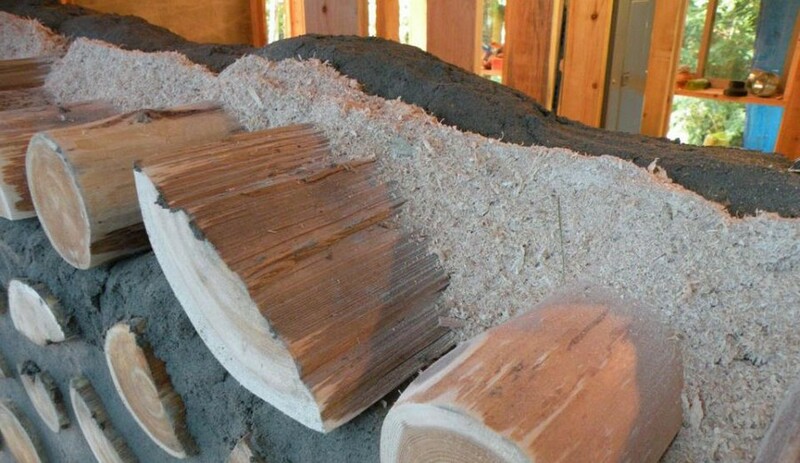 A completed cordwood house should dry well. The ends of woods remain visible both from the exterior and interior side; they become centerpieces of the house. However, you may as well build up a wooden furring and plaster the walls from the inside. 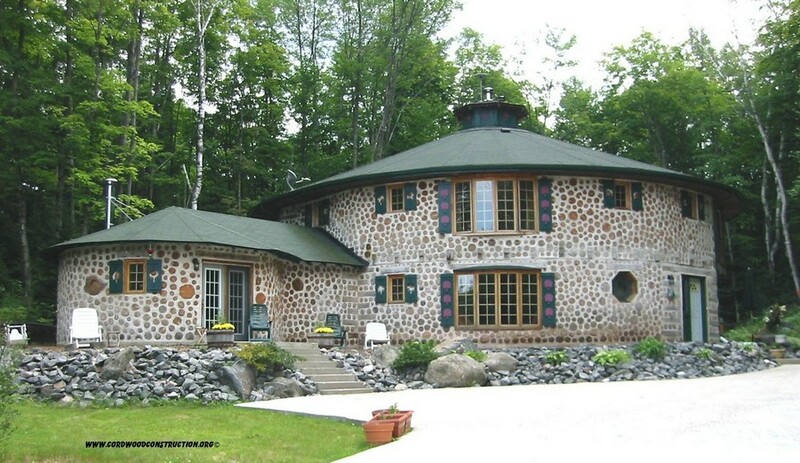 The roof of a cordwood house can be made from any roofing material. There is just one fundamental condition – long overhangs that will protect the walls from rainfall. And if your main intention is to surprise everybody, consider wood shingles or water reed. Just be informed that these natural materials are pretty costly nowadays.